Set amid picturesque surroundings of Lake Murten, Le Vieux Manoir in Meyriez near Murten / Morat is a five star hotel that boasts 3 suites, 19 double rooms, and 10 junior suites, besides a comfortable guest house – ideally known as the Glass Diamond. Built as a romantic country house hundreds of years ago, the hotel Le Vieux Manoir in Meyriez near Murten / Morat is well-known for its exceptional hospitality and 34 remarkably decorated rooms, which are no less than miniature artworks that use high-quality materials and fabrics and an exquisite blend of handcrafted objects and designer furniture. Its idyllic lakeside location makes the picturesque hotel an ideal lodging facility for guests of all ages and types, with exclusively well-equipped rooms, exceptional hotel ambience, first-class culinary options, and high quality professional staff service. The hotel offers special packages to make stay for guests pleasant, comfortable, and relaxed. With its renowned Pinte de Meyriez restaurant, the Vieux Manoir provides some fine cuisine mentioned in the Michelin guide and a Sunday Brunch. 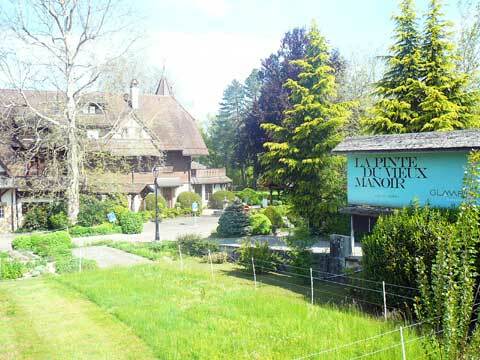 The hotel Le Vieux Manoir in Meyriez near Murten / Morat is part of the famous Relais & Châteaux hotel association. Hotels Fribourg is a web site providing information on lodging (hotels, bed and breakfast), good restaurants, culture and leisure to people that travel for holidays or business in the canton Fribourg Switzerland, including the city of Fribourg, the Lake Murten / Morat, the Bulle Gruyère area and towns like Romont, Estavayer-le-Lac, Charmey, Châtel-St-Denis, Broc or Avenches.